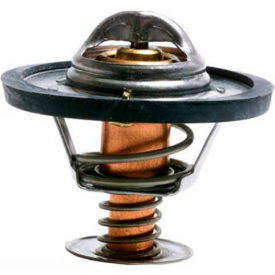 Temperature-controlled valve located in the hot leg between engine and radiator, often mounted on the cylinder head. Controls the flow of coolant through the radiator and regulating heat dissipation. The thermostat allows the engine to reach its operating temperature as quickly as possible; this reduces oil dilution, cylinder bore wear, fuel consumption, exhaust emission, and improves the efficiency of the heating system. Self cleaning and includes a long stroke for maximum cooling.